The majority of homeowners don’t give much thought to the appearance of their porch. But the reality is that a porch can be a useful addition to a well-designed home, especially if you want a place to relax, entertain, or greet guests. In this blog post, we will dive into what it takes to create an attractive porch that improves the appearance of your home. Remember that porches connect your home’s outside to the inside, provide additional living space, keep you connected with your neighborhood, and provide the ideal spot for relaxing outside. Even if they’re small and simple, these wraparound spaces can be critical pieces to the front or back of your home. As this article from HGTV explains, a well-planned porch can breathe new life into a tired house. This type of transitional space can transform the appearance of your home, bringing attention to the front door or adding dimension to a flat-face structure. Not to mention, a revamped porch can boost curb appeal and add much-needed personality to your home. Our Ready Porch features fully self-supported construction, making it an ideal fit for homes with straight rooflines or low ceiling clearance. The metal roof of the Ready Porch allows for a low pitch, therefore conserving valuable head room and preserving a spacious, open feel. Check out our Gable Porch Gallery to see some of our previous work. Whether you’re overhauling the appearance of a current porch or want to add a completely new one that improves the look of your property, it’s important to first consider your goals. Be sure to take into account how you plan to use the space, the available options, as well as your budget. 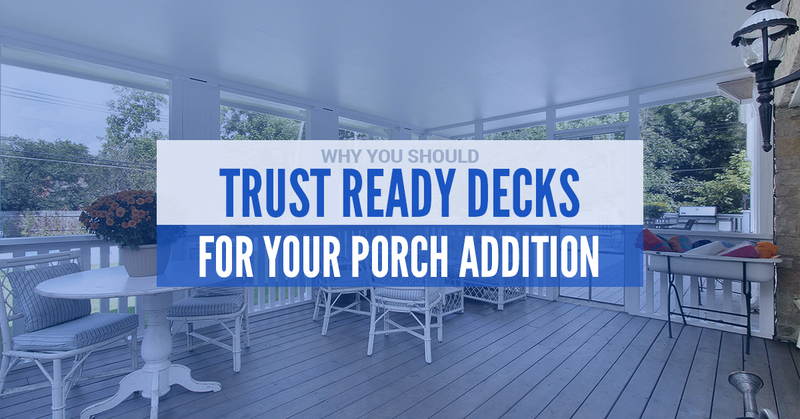 If you’re ready to take the next step and choose Ready Decks as your porch contractors, don’t forget to browse through our Ready Porch Gallery.